External barriers are easier to manage than internal barriers. They include a variety of environmental distractions that can usually be avoided or minimized with simple corrections, like removing yourself from the interfering barrier or removing the issue from the area that you are in. Internal barriers are more difficult to manage, as they reside inside the mind of the listener. Internal barriers’ elimination relies on a high level of self-awareness and discipline on the part of the listener, like catching oneself before the mind starts to wander and bringing full attention back to the speaker. 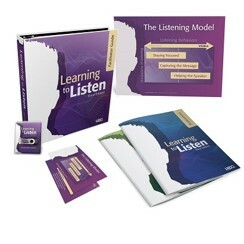 Do you want to improve your and your team member’s listening skills? Set-up a Learning to Listen Workshop (in-person or virtual) for your team. In this hour training, you will evaluate current listening skill levels, understand how to take an active role in the listening process, and then practice the skills you need to development. Request more information. Or, email us at info@insights2improvement.com or give us a call at 888.426.7520, to discuss the details and learn more.